This book is open access under a CC BY 4.0 license. It constitutes a unique source of knowledge and guidance for all healthcare workers who care for patients with sepsis and septic shock in resource-limited settings. More than eighty percent of the worldwide deaths related to sepsis occur in resource-limited settings in low and middle-income countries. Current international sepsis guidelines cannot be implemented without adaptations towards these settings, mainly because of the difference in local resources and a different spectrum of infectious diseases causing sepsis. This prompted members of the Global Intensive Care working group of the European Society of Intensive Care Medicine (ESICM) and the Mahidol-Oxford Tropical Medicine Research Unit (MORU, Bangkok, Thailand) - among which the Editors – to develop with an international group of experts a comprehensive set of recommendations for the management of sepsis in resource-limited settings. Recommendations are based on both current scientific evidence and clinical experience of clinicians working in resource-limited settings. 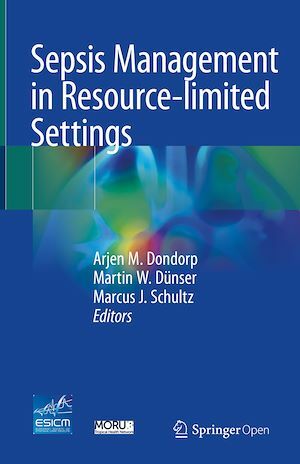 The book includes an overview chapter outlining the current challenges and future directions of sepsis management as well as general recommendations on the structure and organization of intensive care services in resource-limited settings. Specific recommendations on the recognition and management of patients with sepsis and septic shock in these settings are grouped into seven chapters. The book provides evidence-based practical guidance for doctors in low and middle income countries treating patients with sepsis, and highlights areas for further research and discussion.